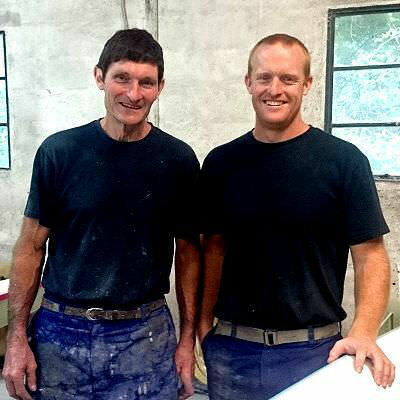 Esteemed South African boat builder, Gordon Rowe, founded Kayak Centre in 1973. Gordon built up a well deserved reputation of being the top kayak manufacturer in South Africa. He produced quality craft, designed and constructed to withstand the rigorous demands of the South African river racing conditions. In 1986 Richard (Rick) Whitton, who had been Gordon’s protégé since 1974, took over the company. He brought his passion, dedication and experience from over a decade of competing on the local rivers to maintain the excellent standards Kayak Centre was already known for. With the subsequent re-inclusion of South Africa in the International racing scene, much research and development was undertaken to encompass the latest international sprint and marathon construction methods. Ken Holden became a partner in 1998 after working for the company for several years. When the ICF rules regarding boat specifications changed during that year, further research and development into kayak designs was needed to ensure that Kayak Centre remained at the forefront of the industry in both domestic and international markets. Today Kayak Centre is owned and run by Rick and his son Clive Whitton. Clive became a partner at the end of 2012, following the departure of Ken Holden. Clive grew up in the canoeing community, competing in multiple disciplines. He worked at Kayak Centre for nearly 10 years before moving to London to compete more regularly at international Canoe Polo events, and work for Canoe England. In order to stay at the leading edge of the industry, Kayak Centre draws on the experience of sponsored athletes to continually improve their products, as well as drawing on the expertise of world leaders in the composite and fibreglass industry. Since 2005 they have used Computer Aided Design (CAD) Technology to create original shapes, which are then cut on a Computer Numerical Control (CNC) Machine to ensure 100% accuracy. This combined with their new-age design philosophy, personal attention to detail, and experience as manufacturers and paddlers ensures that their products are of the highest standard possible. Each Kayak Centre craft is hand finished by Rick or Clive to ensure it meets your individual specifications. Their motto of “Quality comes with Experience” has been hard earned, and they strive to meet the modern demands of our sport whilst retaining the old-fashioned quality developed with pride over many years.